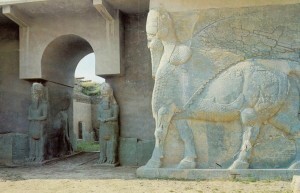 Entrance of Nimrud Royal Palace, guarded by a Lamassu. 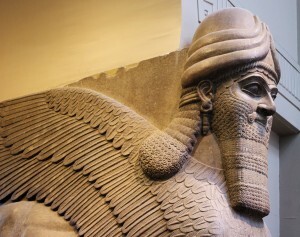 Nimrud is the Arab name for the ancient Assyrian city of Ashur (or Aššur). It is located in the north of Iraq on the Tigris River within the Mesopotamia region, and is 30 kilometers southeast of the city of Mosul.Archeologists believe that Nimrud received this name in reference to the Biblical Nimrod, who was a hunting hero associated with the dynasty from which the Assyrians derived. The city dates back to the 3rd millennium BC. From the 14th to the 9th centuries BC it was the first capital of the Assyrian Empire, a city-state and trading platform of international importance. Nimrud was located in a strategic position 10 kilometers north of where the Tigris River connects with the Great Zab River, a long river flowing through Turkey and Iraq. In addition, the city served as the religious capital of the Assyrians, associated with the god Ashur. The city succumbed to destruction by the Babylonians, but revived themselves during the Parthian period in the 1st and 2nd centuries AD. 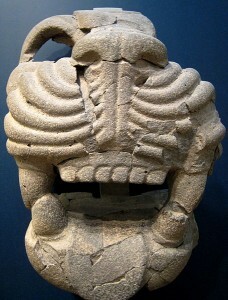 Details of a Lamassu, which had the body of a lion and a human head. The major archeological excavations occurred during the 19th century, and revealed remarkable bas-reliefs, ivories, and sculptures, among which more than half a dozen pairs of colossal guardian figures guarding palace entrances called Lamassu. These statues consist of a male human head, the body of a lion or bull, and wings. The British Museum and the National Museum of Iraq display many of excavated artifacts. Artifacts retrieved in Nimrud had a major role in the Biblical history studies and the scholarly history of the alphabet. Lion head coming from Nimrud Palace.